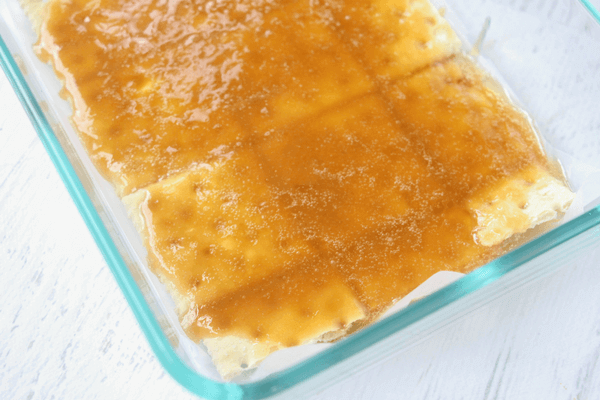 Cracker Toffee is my go-to homemade gift when we’re attending a little get-together or a party. 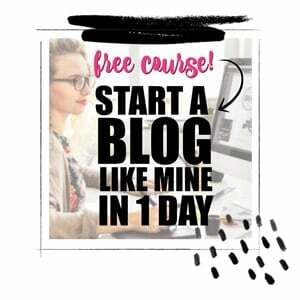 Everyone gets so excited to see it, yet it’s so incredibly easy to make. 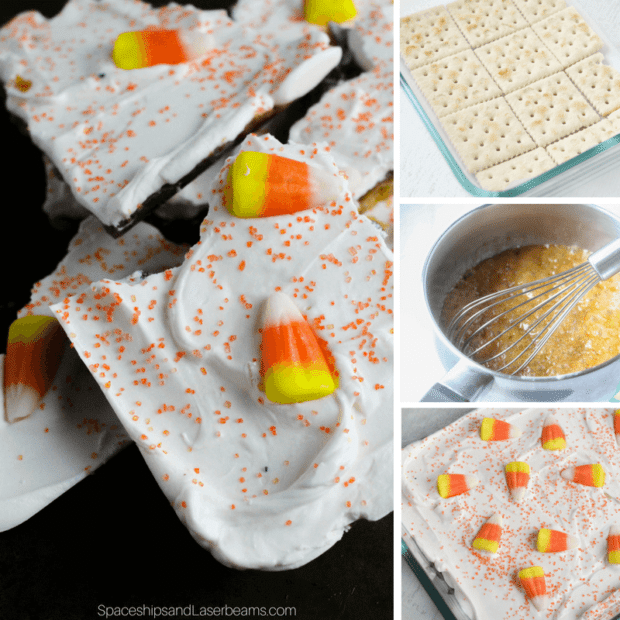 For our fall get-togethers I’ve prepped a batch of Candy Corn Cracker Toffee for a fun twist on the classic! This Candy Corn Cracker toffee is sweet and crunchy, with a smooth white chocolate coating and a sprinkle of those quintessential fall candies providing a chewy contrast. 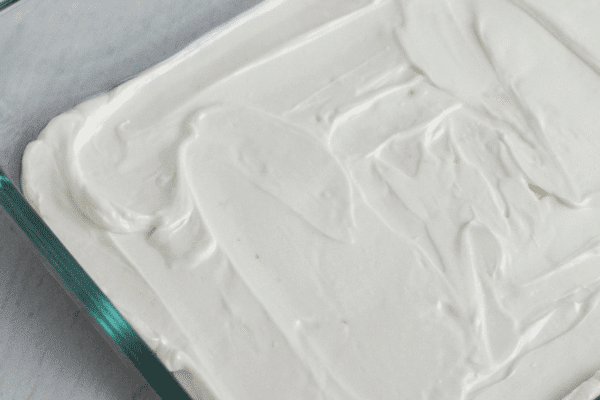 The whole recipe comes together in less than 15 minutes and then it just sets up in the fridge as you get ready for your Halloween party (or just get into some cozy pyjamas if you’re making this as a late night treat). 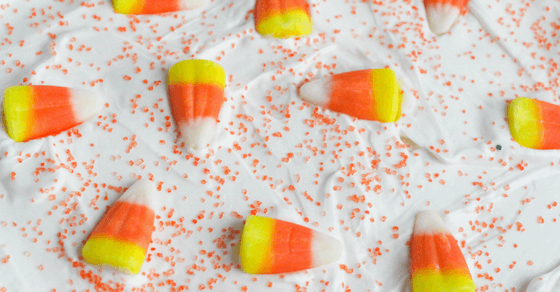 You’re going to love this Candy Corn Fudge, too!! 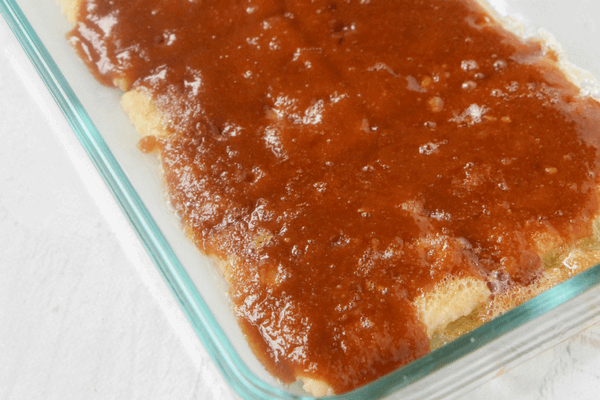 I tried a few different methods of achieving a white topping for this cracker toffee and it involves a slightly different process than my usual cracker toffee recipe. Instead of adding white chocolate chips overtop of the toffee and then placing it in the oven to melt, I used white chocolate melts and placed the tray in the microwave for 45 seconds. The white chocolate chips burnt too quickly in the oven, and so did the candy melts I tried to achieve a candy-corn colour pattern with, too! 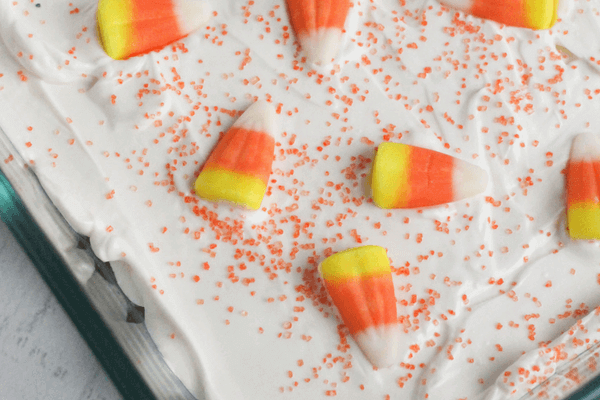 I’m definitely adding this candy corn cracker toffee to the list of our favourite Halloween desserts – along with our easy Ghost Meringue cookies and pumpkin rice krispie treats. What is your go-to fall dessert for parties? 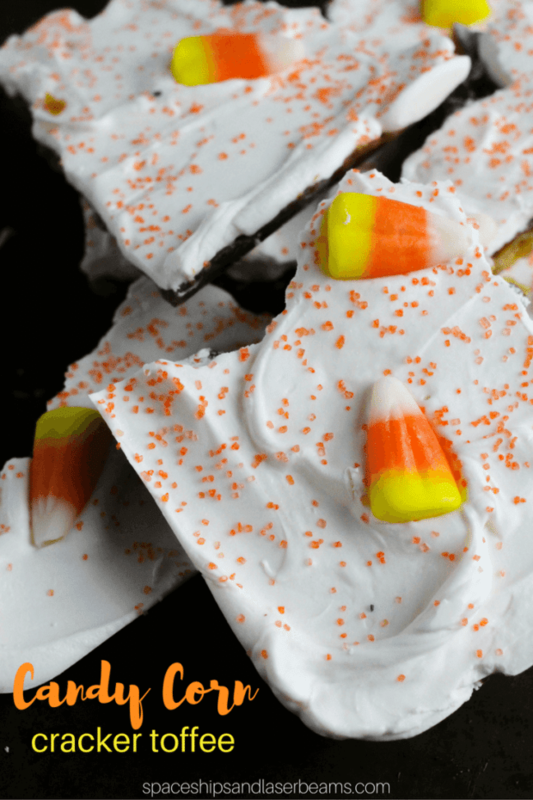 Candy Corn Cracker Toffee for a fun twist on the classic! 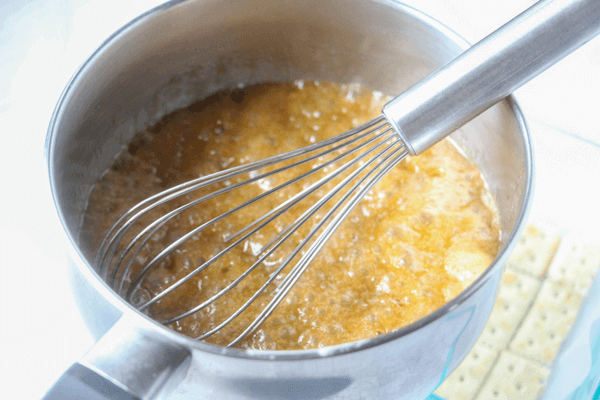 Sprinkle yellow and orange sprinkles over the melted chocolate while it is still wet and then add on the candy corn. 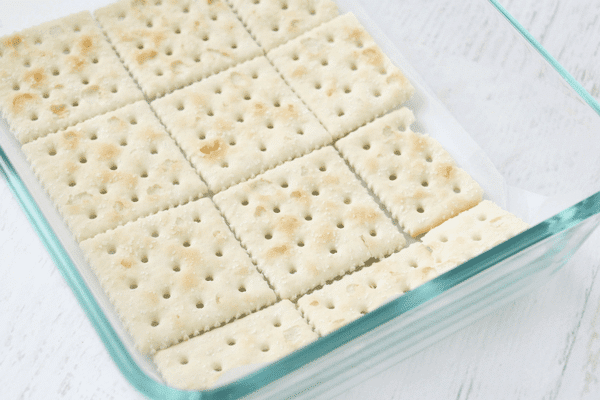 And then the fun part – crack your cracker toffee into serving sized pieces (we all get to decide what our own serving size is – I won’t judge!) and serve! 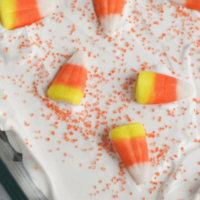 Check out these other great Halloween themed recipes here…. We love this for Halloween! !